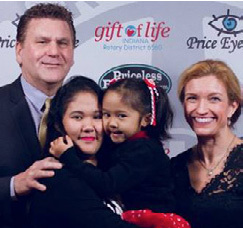 Gift of Life Auction Raises Over $52,000 – In February, the RC of Greenfield held it’s 18th annual Gift of Life Auction. This year’s auction was excited to welcome recent GOL patient Johanna and her mom Carmina, as well as GOL International CEO Rob Raylman, from Lebanon Dr. Issam El Rassi (pediatric heart surgeon) and Lina Shehayeb (founder and chair of GOL Lebanon and Past President of RC of Aley, Lebanon), the Riley Surgical team, and D6560 leadership. Always a ton of fun, the evening didn’t disappoint. The club is grateful for the generosity of donors and guests as the club raised over $52,000 for our District’s Gift of Life program.